Matt’s Movie Reviews, on behalf Icon Films Australia, is proud to give you the chance to win a double-pass to see Ghost Stories starring Martin Freeman! "Based on the critically acclaimed, record-breaking play, GHOST STORIESfollows Professor Philip Goodman (Andy Nyman), a renowned sceptic of all things supernatural. His idol, psychologist Charles Cameron, who had mysteriously disappeared, reveals to Goodman that he has been in hiding since realising his own arrogance in trying to rationalise the spirit world. Accusing Goodman of the same disrespect he gives him three case histories to solve: a night watchman haunted on the job; a troubled man confronted whilst broken down in a forest; and a city trader (Martin Freeman) disturbed by strange goings on as he awaits the birth of his first child. Each baffling, horrifying case supports the existence of unseen forces, taking a toll on Goodman and everything he has ever believed." 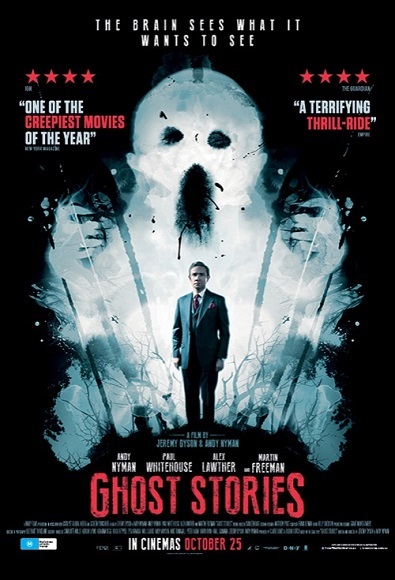 Ghost Stories releases in cinemas October 25! 1) Write in 25 words: What is your favourite movie British horror movie? Giveaway offer ends Sunday the 21st of October, 2018!! !